This post is a hodgepodge of a lot of ideas and fun finds, almost too much for one post, but each subject isn’t enough for one. So, enjoy reading a bunch of different ideas, all pulled together. First, it is fun to find special things at the thrift store, like a treasure hunt when you don’t know what the treasure might be. Recently, I came across a mug that looked really familiar, the one on the right in the picture below. It was 50-cents. I loved the sleigh design with the cardinals, but I didn’t need another single Christmas mug. I couldn’t place it at first, then I realized it was a match to my Christmas dishes that I use for everyday during December. I stood and thought about it for a bit, picked it up and carried it around the store for a while longer. What good was just one? But for only 50-cents, how could I go wrong? So I got it. Imagine my surprise to come across another one just a few days later!! The second one with the tree was a few dollars, but there was no way I could pass it up. I set them on our counter for breakfast. The cute cookie jar that I got in the Mini Cooper Club gift exchange shares space on the little mat with a Santa topped candle to create a centerpiece. 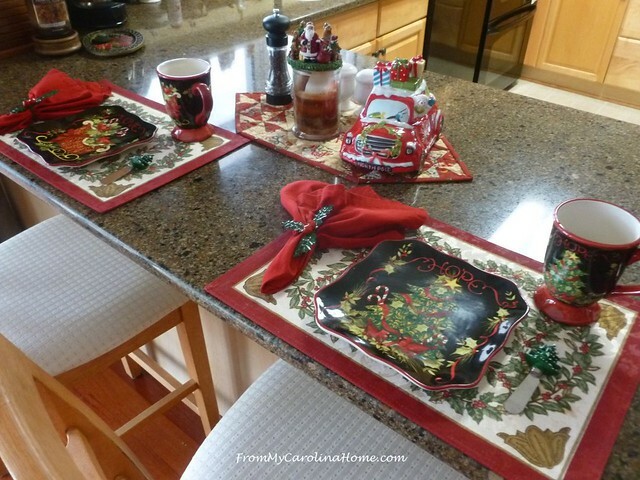 Red napkins held with holly berry napkin rings are set on holly themed place mats. I added the Christmas tree spreaders for spreading butter on toast or waffles. Now, will I be able to find the other two mug designs to complete the set? Only time will tell. If you run across one in your treasure hunting at a reasonable bargain, let me know and I’ll probably want it. 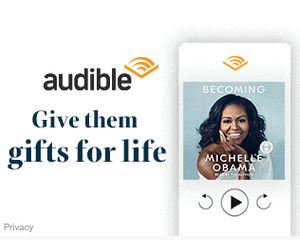 Looking for the two I don’t have – the Christmas Stocking and the Christmas Gift package, and I’ll pay for shipping. They are by Certified International, and are a Susan Winget design discontinued many years ago. 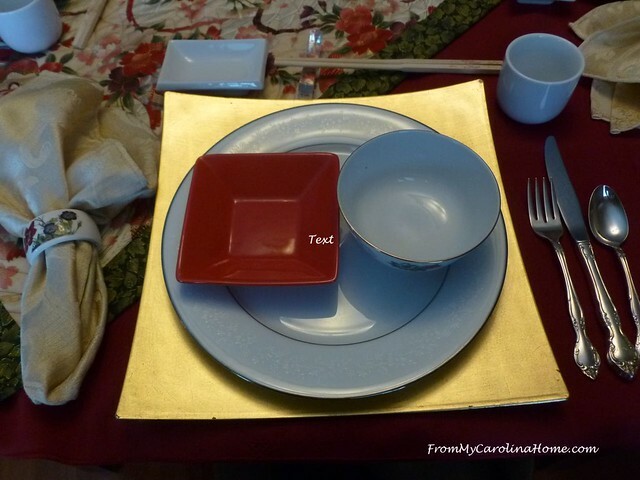 For my Asian Inspired Tablescape, most of the setting came from thrift stores over the past year, just picking up items as I see them. The soy sauce dishes, sake cups, red square dishes, rice bowls, gold chargers and napkin rings were all thrift store finds. On the sewing front, my block was published last Saturday on the Moda Bake Shop website as part of their Countdown to Christmas. 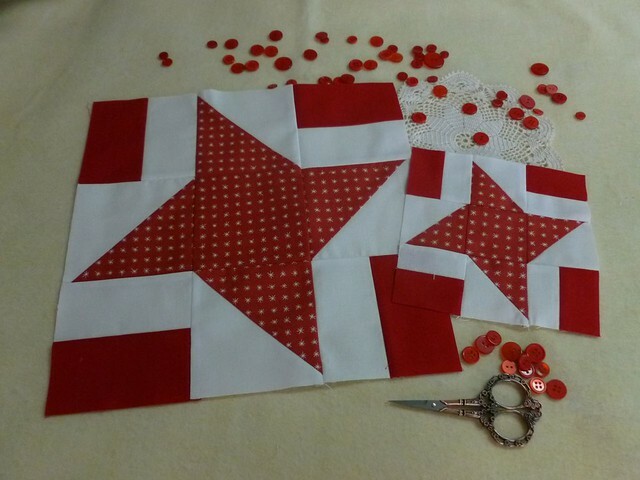 My block is Shining Star , and there is a free download on the post. It isn’t too late to go back and get all the blocks so far, just visit Moda Bake Shop. The event continues with a new block everyday for a few more days. 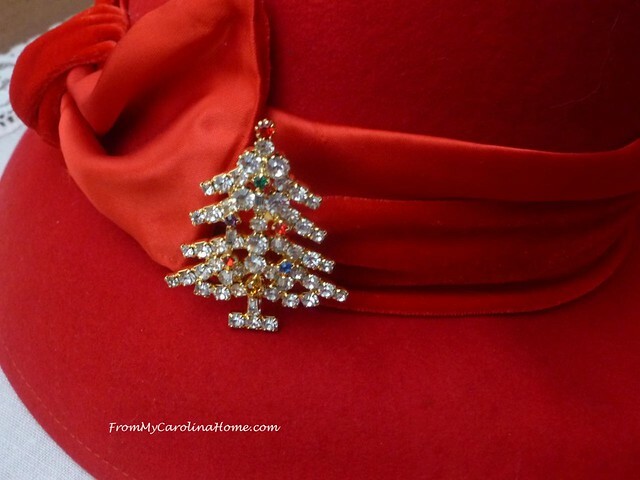 For the Christmas parade, I found a red hat at the thrift store and pinned one of my many rhinestone pins to to the band. I got a lot of nice comments about it while I was wearing it. DH had on a Santa hat, and I guess that made me Mrs Claus. For the bathroom, I put a cute little sleigh that was the perfect size for a crystal reindeer that I have had for many years on the counter. 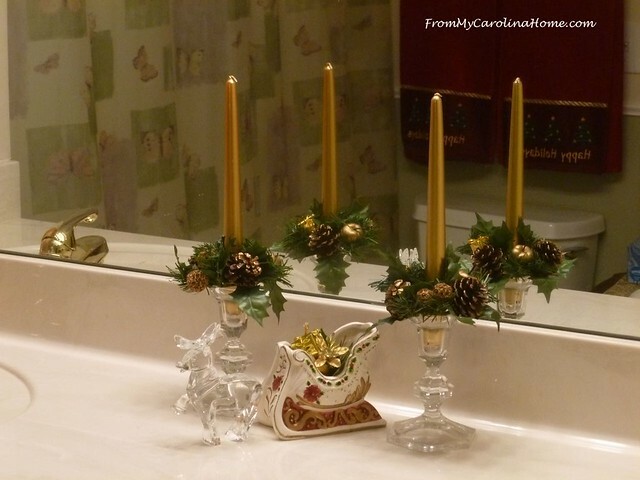 I placed gold metallic candles in crystal holders (thrift store finds from years ago) and added some candle rings picking up the gold in the sleigh. Tiny gold packages are inside the sleigh. In the mirror, you can see the Happy Holidays bath towels my mother gave me some years ago. 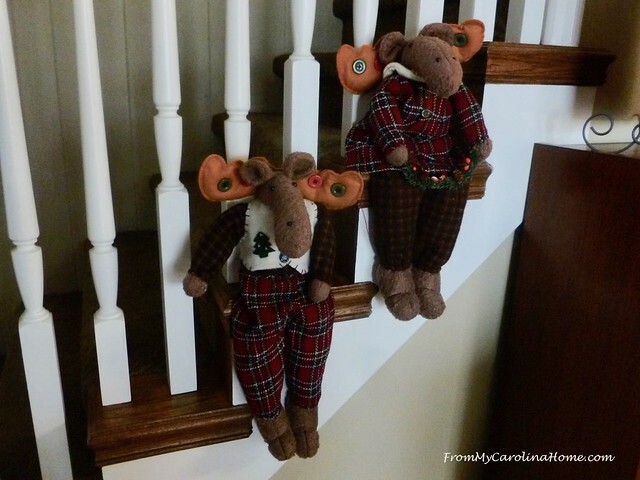 On the staircase, for the past few years I’ve put our stockings with holders, but this year I decided to let my goofy moose sit there instead. I got these at a clean-out-your-closet silent auction some years ago. 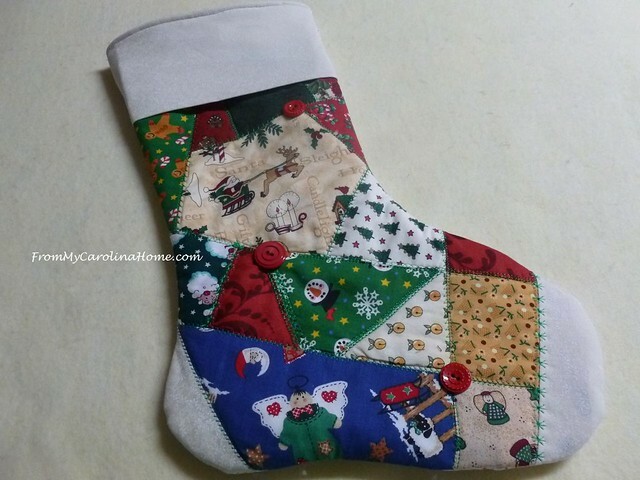 For Madam Sew, I did a tutorial on how to make a Crazy Patch Christmas Stocking With Decorative Stitches on your machine. As usual, I show you my mistakes too, and how I fixed them. I used all Christmas scraps and covered my boo-boo with a big red button, then added a couple more buttons so it looks intentional. 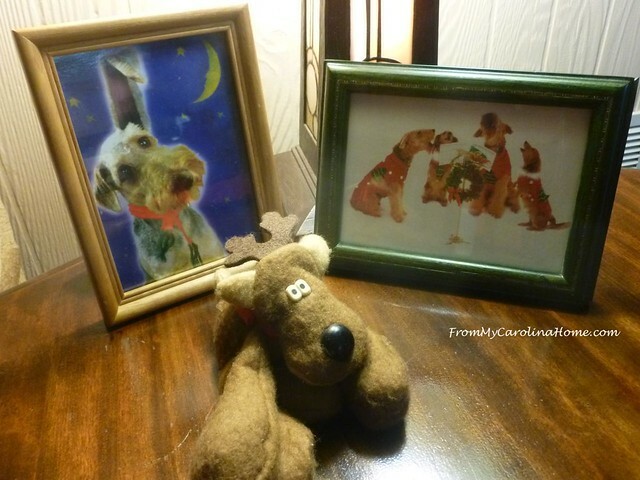 Last year, I talked about framing special or fun Christmas cards for use in your holiday decor, but I couldn’t find my singing Airedales card. This year, I found it and another really cute terrier one (inside that one says ‘Do you hear what I hear?”), so I hit the thrift store for some cheap frames. 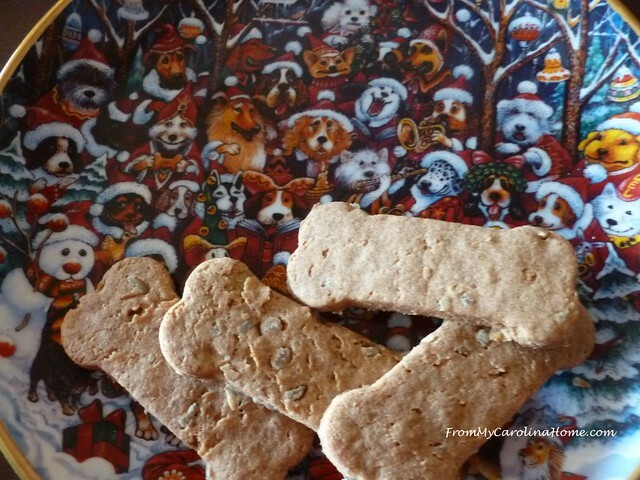 One note about our beloved dogs and the treat recipe I gave you on Sunday. Alert reader Joan wanted everyone to know that certain brands of peanut butter are toxic to dogs. Most supermarket brands like Jif, Skippy, Peter Pan and Smuckers are fine, but some less well known brands contain Xylitol which is toxic to dogs. Thank you, Joan, for helping to keep our pets safe. Please check your peanut butter for Xylitol, and if it has that as an ingredient, do not use it for dog treats. I had to stamp a few more cards too. I think my favorite one of this group is the one with the sticker banner across the top. It is placed over the framed Santa collage, and the little packages are another sticker. I still have lots of this paper left, so you might see more of it next year. Remember the Birdcage project from last summer? For December, I removed the planter and filled the inside with faux greenery, holly and poinsettia blooms. It is next to the front door, and I think looks quite festive! It was all done with things I had on hand in the stash. Do you have a treasure hunting or upcycling story to share? 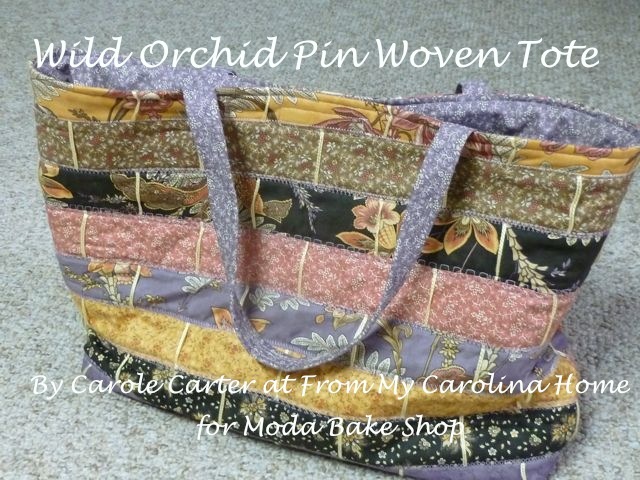 Are you sewing last minute gifts? 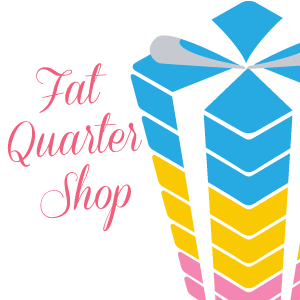 Fat Quarter Shop 20% off Moda Metallic Grunge Seeing Stars! 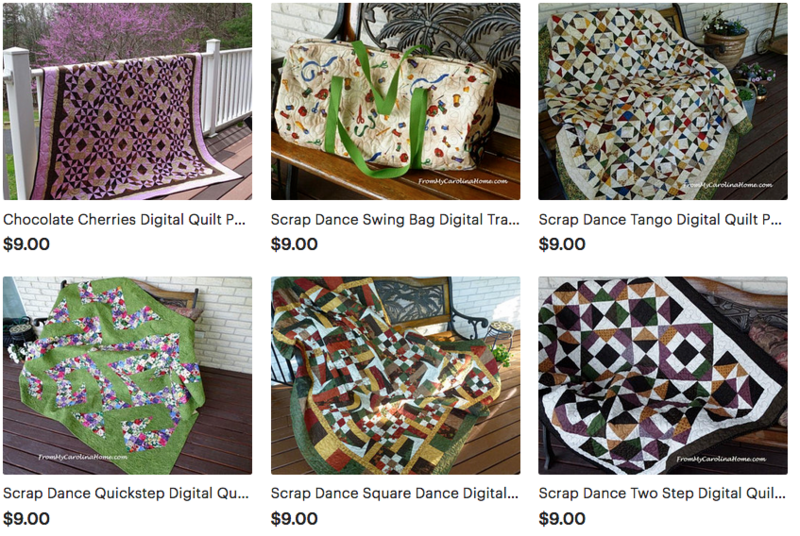 Craftsy 50% Off Quilting Fabrics and 30% Off Crafting Supplies. Everything looks fantastic — great finds! These are all very festive! I have struck out completely at thrift stores recently. Great finds with those mugs that match. I believe I have some stamps designed by Susan Winget. 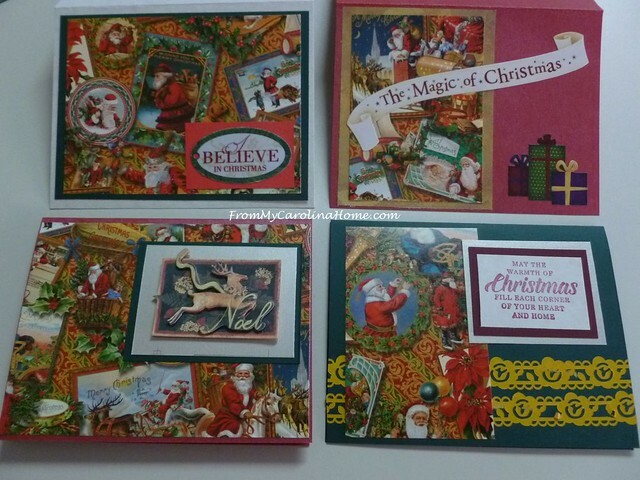 The cards look great, that paper will go a long way, it is so interesting. I did not decorate for Christmas this year, it’s been too busy around here and in a mess for a remodeling project coming Jan. 2. But your ideas make me want to definitely plan for next year. I have a thrift store bird cage. I had no idea how I was going to use it-now I know! I have loads of faux greens and flowers for various seasons. Thanks. Everything looks very pretty, but I would be apprehensive drinking from second hand mugs. Carole, you have some great finds that I enjoyed seeming. Merry Christmas to you and yours! Carole, your cards are just lovely. What a treat they are for your friends and family to open! Lots of beautiful finds and displayed so lovingly. Thanks for lots of ideas. That’s a mini cooper cookie jar?! Too cute!!! Great find on the mugs. That red hat is rich. Goofy moose–LOL! Love your Christmas bird cage!!! Thanks for sharing, Carole! 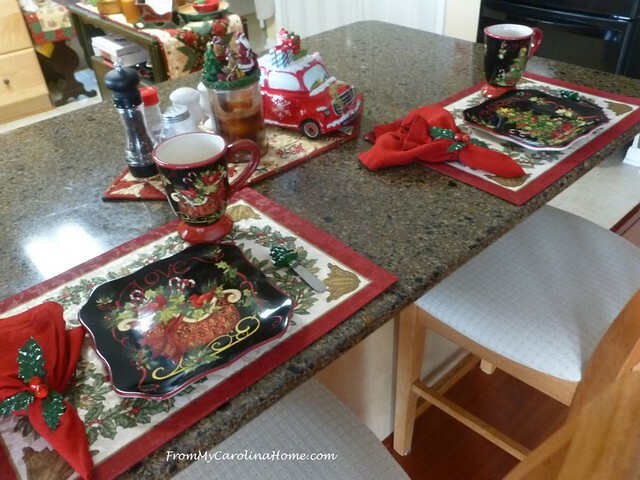 Your countertop tablescape with the new mugs is so much fun! I love having different Christmas mugs to use everyday. 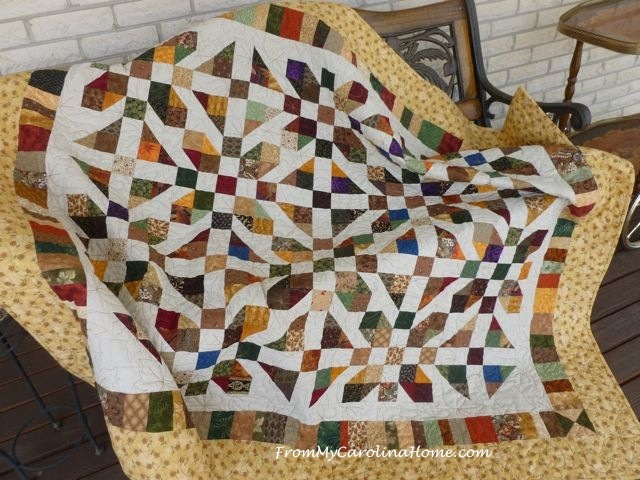 The block you did for Moda Bake Shop is so pretty – I bet a whole quilt of that block would have a fun secondary design where those corners meet! 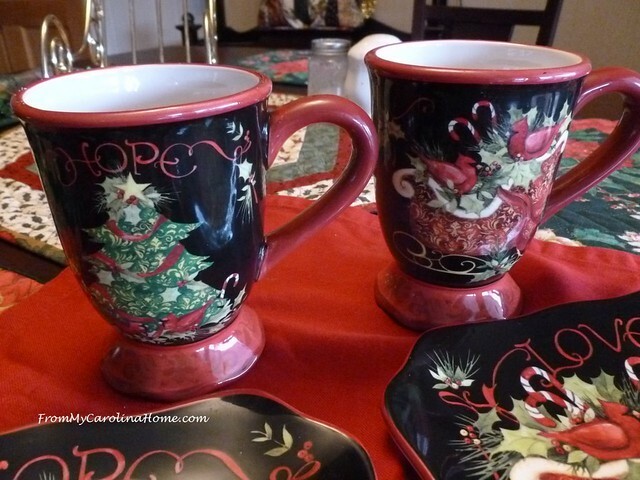 Hello Carole, I am thrilled for you at having found the Christmas Mugs! Plus, sharing all of your fantastic decorating skills are indeed welcomed. I sure wish that I had your skills in decorating and creating beautiful displays! We have not been to very many garage sales or thrift stores this past year, but we always have a wonderful time when we do. Thank you for sharing and have a splendid day! 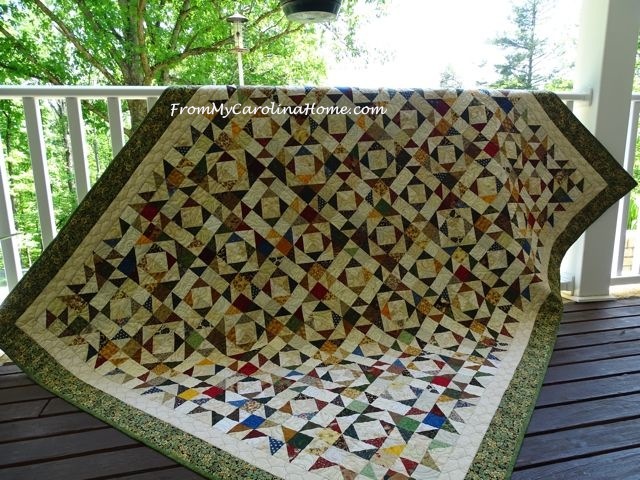 Carole, I started following you at the suggestion of a quilting friend. I did not know you had so many other hobbies. Where do you stash all of your supplies for your tablescapes, card making, cooking, yard work and your quilting? My house is overflowing with my quilting stash. I’m not sure where I would put all the lovely items I would need for tablescaping. You need to share your secrets for organizing. 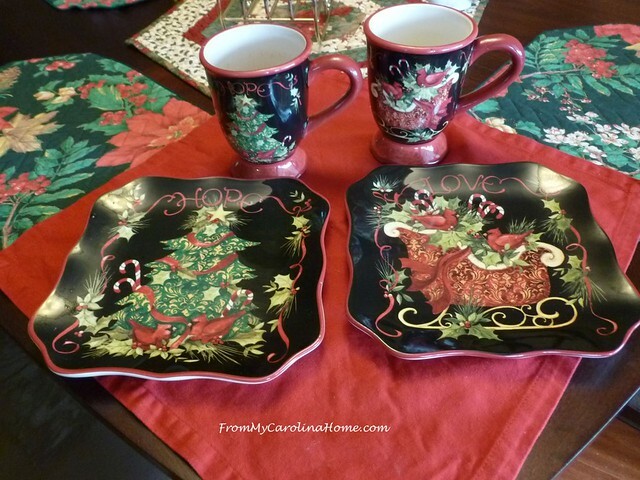 Thank you for sharing your Christmas prep – those cups are fantastic!! I also went and got all the Moda Bake Shop patterns…a see a fun quilt or two in my future!! Love those cups and plates! 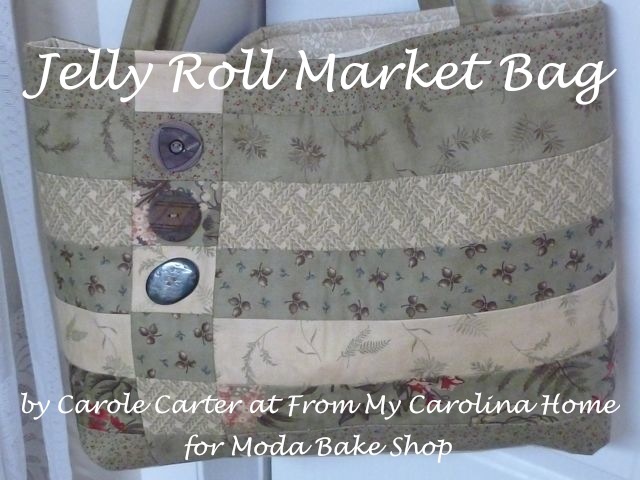 Heading over to Moda Bake Shop and see if I’ve missed any of the blocks and to pick up yours! Thanks! What a festive post! I love the bird cage, and I want to go check out the Moda Bakeshop, but I better wait until my sewing projects are finished! I got the collar all done on DH’s shirt today, so just have the sleeves to do and the hem. I have been sewing the buttonholes as I go, so even the tiny ones for the button down collar are finished.😅 I have a pair of pj pants to do tomorrow and three quilt blocks, but I am hoping to have most of it finished by mid afternoon. We’ll see! The two cups are a wonderful find! The birdcage looks fabulous! I love everything that’s gone into it. It is lovely to see the decorating in your home. And it really shows what treaures you can pick up in thrift stores. Good luck with completing the matching set of mugs and plates. So many pretty accents, Carole! 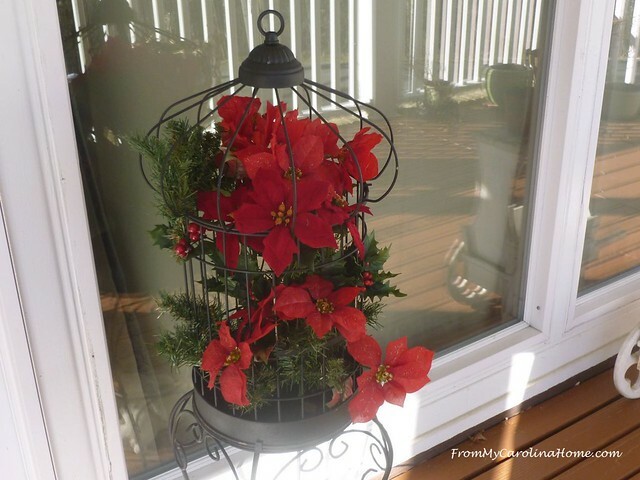 I love the poinsettias added to your birdcage! Thanks for sharing at Vintage Charm. Happy New Year!